Jasper is the county seat for Pickens, known for its welcoming, small town feel. Jasper is a popular community for equestrian and farm properties, sprinkled with the occasional subdivision or gated community. Jasper is truly a scenic community, with an abundance of beautiful mountain and lush valley views, yet it is only 55 miles north of Atlanta. Jasper has several unique festivals and destinations, including the annual Georgia Marble Festival the first full weekend in October, and the Annual Sheriff’s Jeep Fest over Labor Day Weekend. Area wineries have quite a following, including Sharp Mountain Vineyards, Fainting Goat Vineyards, and Chateau Meichtry Vineyards. Marble from Georgia Marble, which is located in Tate, a small community near Jasper, has been used in architecturally and historically significant settings including the Supreme Court, Lincoln Memorial, Arlington National Cemetery tombstones, and more. Jasper is home to Piedmont Mountainside Hospital, offering internal medicine and cardiology services with a staff of over 95 doctors. The local Chattahoochee Technical College offers 35 courses of study across many disciplines. Although a mostly rural community, Jasper is home to top shopping destinations for the entire Atlanta area, including the Bargain Barn and Sackets, both offering the outdoor sporting and nature enthusiasts many options. National chains like Home Depot, Walmart and Kroger have sprung up in recent years along the Hwy 515 Corridor. 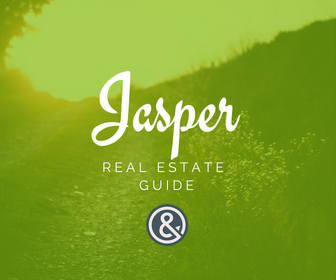 What's Your Jasper Home Worth? Why do we love Jasper? The quieter lifestyle and abundance of open areas. Hit the trails early with one of the many great hiking spots you can find near Jasper, maybe even swing by the zipline for more adventure before lunch. Spend the afternoon tasting samples at one of the North Georgia wineries before heading back to the beautiful main street setting for dinner with friends and family. One Thing to Know about Living in Jasper? It’s one of the few areas of Metro Atlanta where you can still connect with wildlife and nature in your own backyard.